After being closed to the public for the past eight years, the Rotunda in Collins Park (on Collins Avenue between 21st and 22nd Streets) may soon be reactivated. Last week, the Commission approved a proposal from the Miami Beach Cultural Arts Council for an artist-designed performing arts center. Miami Beach Director of Tourism, Culture and Economic Development, Eva Silverstein said, “The idea is to create a flexible performing arts space. 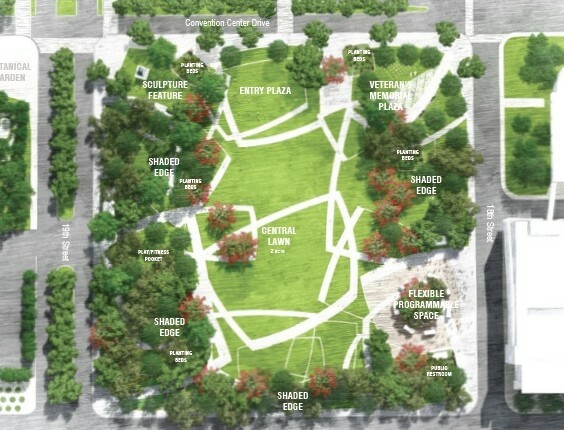 It could be used for spoken word performances, theater in the round, a small dance performance, an art installation.” Silverstein said the CAC would be responsible for curating and programming “so it would bring more performing arts into Collins Park,” while the City would manage the space. Money for a buildout would come from the CAC’s endowment fund. Brandi Reddick, Cultural Affairs Program Manager, told Commissioners, “One of the things the Cultural Arts Council wanted to do with their endowment is to create a legacy program, a physical space, a capital project that can live out the legacy of what this endowment was created for.” She said the CAC would work in collaboration with the Bass Museum of Art and the City to create “this really beautiful artist-designed performing arts space that could be used for theater in the round, small dance performances, and activations outside of regular museum hours.” The expansion of hours for park activation was something that appealed to Commissioners as well as the neighborhood. Ray Breslin, President of the Collins Park Neighborhood Association was on the original planning committee for the park. He said, “The original vision for the Rotunda was a performing arts space.” He gave an enthusiastic thumbs up to the proposal. “I am thrilled that somebody’s coming through wanting to make that a performing arts space.” While the Bass had proposed using the space, Breslin said that would not increase the hours the space would be used for arts programming and would not “bring in anybody new to the park … I think we need to work on bringing more people to the park for various events." Silverstein said once built out, the space will seat more than 100 people, maybe more if the balcony can be utilized as well. She said the CAC endowment fund balance is at $1.5 million and the anticipated buildout costs are in the range of $600,000-800,000.